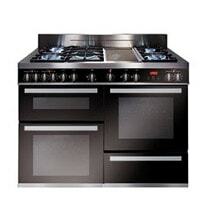 Whatever your cooking style, we have a range cooker designed to suit you. 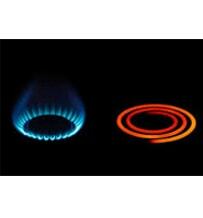 Whether that is all gas, all electric or a combination of both you can choose what works in your home. 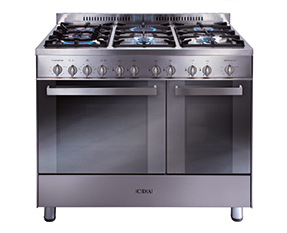 Our all gas range cooker offers traditional cooking style with gradients of heat within the oven cavity. Many customers prefer this as they can cook several dishes, which require various temperatures, simultaneously. 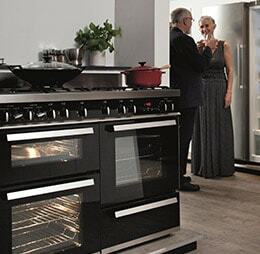 The dual fuel models in our range offer the best of both with stylish cast iron supports and temperature controlled electric ovens, combining the top features from both fuel types. The all electric models offer controllable cooking temperatures as well as duel zone hob areas to suit every size and shape of pan. If you really love cooking on gas, but don’t have a mains supply to your house, you can simply convert your cooker to an LPG gas supply using the conversion kits included with our gas and dual fuel models. 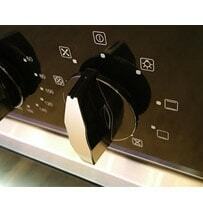 All of our electric and dual fuel range cookers have a fan oven. 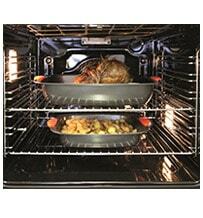 The fan is used to circulate hot air around the cavity to create an even cooking temperature throughout the oven. The advantages of a fan oven are that cooking is faster and preheating is rarely required, you can use multiple shelf levels and expect the same cooking results and cooking times will be slightly reduced due to the efficiency of this function. Possible downsides include the fact that you will achieve a slightly less browned top to dishes, food may become drier due to the hot air circulation and you may also burn food as you are not expecting it to cook so quickly. 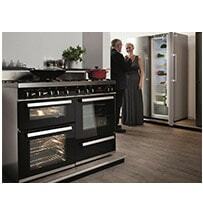 The second oven, and even the third oven on our largest model, is usually a conventional oven with a grill. This means that you can have a dedicated grilling space if you need it, or you can use the browning element of a conventional oven to crisp up dishes whilst you finish the rest of your meal. 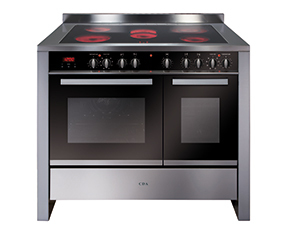 A conventional oven uses the top and bottom elements to cook food, creating a centralised ideal temperature that is at its forte when used for baking or roasting. The side effect of this cooking style is that you will have a slightly hotter oven at the top and a slightly cooler oven at the bottom, but this can also be used to your culinary advantage for cooking at different temperatures simultaneously. 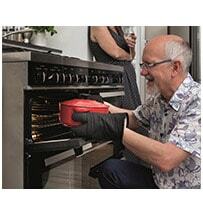 Our gas range cooker uses a continental flame at the base of the oven to heat up the cavity. This is the most traditional method of oven cooking, and some people swear by it! The gas oven creates a top level that is hotter than the bottom, due to the heat rising. Many cooks love this as you can ‘zone cook’ your dishes at different temperatures and have everything ready at the same time. When compared to electric, a gas oven is often considered a less drying way to cook-perfect for that roast chicken.